When Manchester United walk onto the pitch against FC Barcelona at the Nou Camp and Ole Gunnar Solskjaer takes his seat on the bench, the Norwegian might well be overcome by emotions. He has indelible memories from the iconic ground with its towering stands. His injury-time tap in at the far-post that rose steeply and dramatically rippled Oliver Kahn’s net in the 1999 Champions League final instantly became a landmark moment in Manchester United’s storied history. The reality for his players is somewhat different though. Chris Smalling was the only teenager in '99 from Manchester’s starting eleven in the first leg. Spanish goalkeeper David de Gea was nine. At the other end of the team age band, Diogo Dalot was still in nappies and Marcus Rashford was just two. Solskjaer’s winner will be a distant memory for some, but for most a goal reduced to a simple YouTube moment. The sheer myth-making around the Norwegian’s goal and his roaring coaching ambitions at Manchester United – he spoke of wanting to deliver a treble at Old Trafford – shroud perhaps a simple truth: could it be that the team powered by Lionel Messi is simply too strong to beat? That is the reality Solskjaer and Manchester United face in Catalonia after a sobering first-leg experience. It has little to do with football folklore from the '90s. In a way, those 90 minutes in the North of England had been a strange paradox. 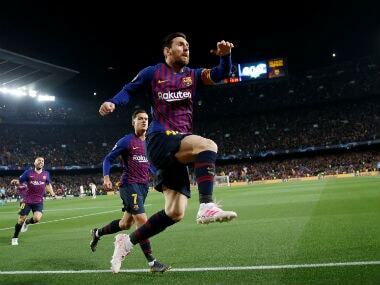 The hosts reduced Lionel Messi to a subterranean in a competition he has dominated this past decade together with his Portuguese nemesis Cristiano Ronaldo. Messi was peripheral in the match and yet he tilted the game in Barcelona’s favor in the 12th minute with a floated assist for Luis Suarez. 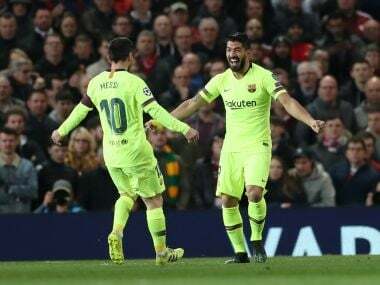 The passage of play in the build-up was quintessential La Masia, involving all the players of the team in an elaborate chessboard move of beguiling beauty that culminated in a change of pace and a diagonal run from Messi, who connected with the ball to cross for Suarez. After that sumptuous goal, Barcelona proffered a conservative game that teased Manchester United, who closed down their provocateurs, but never got quite close enough to shackle and defeat them. Messi withdrew in a crowd of mortal Catalans. He didn’t discard his phenomenal qualities, but it was a modest night by his own standards. With Messi in the shadows, Barcelona were accused of playing an underwhelming match that betrayed the tradition of the club. That was a misinterpretation: Barcelona didn’t play compelling football, because they didn't need to. Solskjaer’s team didn't have the wherewithal to play toe-to-toe with Barcelona. The stats at the full-time whistle were confronting: Manchester United ceded 71 percent of possession to their ‘sloppy’ opponents and up front Romelu Lukaku and Marcus Rashford didn’t register a single attempt on target. 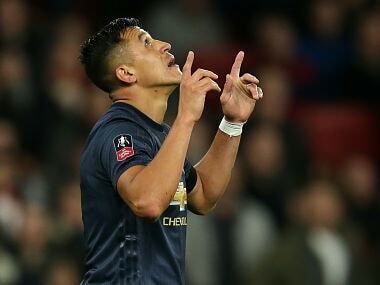 Even against West Ham United in the weekend, Manchester required two spot kicks to win the game, because of its misfiring attack. Philippe Coutinho and Luis Suarez didn’t excel either at Old Trafford. The midfield trio of Sergio Busquets, Ivan Rakitic and single-name Brazilian star Arthur almost looked mundane. In isolation, the Barcelona players could not be associated with the longstanding excellence of their club or the unmatchable paradigm that the Xavi-Iniesta duo has burdened all their successors with. But as the team’s decisive first-half strike demonstrated – when they do come together, the implications can be devastating. Barcelona followed that bit of ingenuity up with a controlled 78-minute containment act. That is what Manchester United will face on Tuesday in the return leg: a 1-0 deficit and the knowledge that Barcelona possess a vastly superior team – and not the memories of their coach’s treble-winning strike or the glory that stemmed from that night. Their hosts have not been beaten at home in the Champions League in 30 matches ever since Bayern Munich inflicted a 3-0 defeat on Barcelona in 2013. At least, away wins at Juventus and PSG, all the more remarkable as United were without ten key players, including Paul Pogba, will boost Manchester United’s confidence in manufacturing another great comeback.